Toobee® The Amazing Flying Can- Fun! Fun! Fun! Amaze your friends! Watch heads turn as it sails soars swoops and curves. Toss it for distance, accuracy for fun or competition. Already Toobee® has been flown over 283 feet (94 yards). That's just six yards short of a football field. 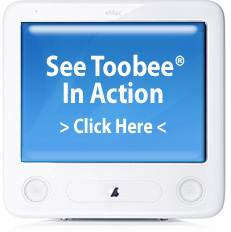 More than just a toy, Toobee® is really a new sport...to be played alone, with the family, or with a group of friends. This aerodynamic wonder weighs less than a marshmallow, has no sharp edges, and can be flown safely indoors or out. Fantastic gift idea. For ages 5 to 105. Order today! Shop for Toobee Air Force Flight Gear.